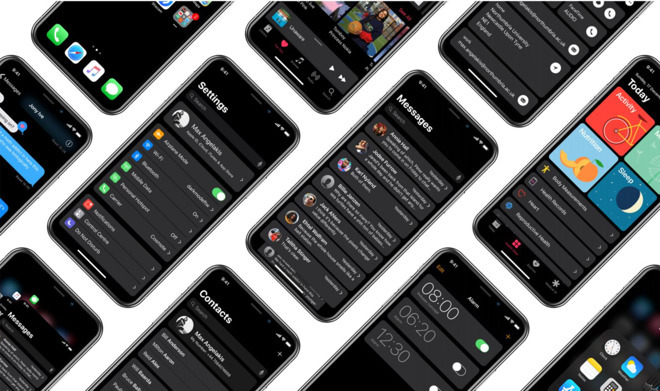 iOS "dark mode" concept via Max Angelakis. Word first surfaced earlier Tuesday that Apple internally told developers that some key features planned for this year would be pushed back to 2019 to allow the company to focus on performance and reliability. Following that report, Bloomberg chimed in separately to confirm the delays, and also add some additional details. It said that "flashier changes" like the redesigned home screen are not expected to arrive until next year. And while the advanced photo sorting capabilities in the works are also likely to be delayed, reporter Mark Gurman did say that "some smaller upgrades to the Photos app will still appear this year." Other enhancements said to be in the works are improvements for FaceTime video calling, and improved parental controls. Also expected to remain on track is the so-called project "Marzipan" that will simplify developer tools with a unified code base, potentially making it easier to port iOS apps to the Mac. If Apple sticks to its regular annual release pattern, as is expected to do, then "iOS 12" should be unveiled at the company's Worldwide Developers Conference in June, before launching to the public in September. In the interim, the company is working on a new iOS 11.3 update that will give users the ability to check the health of their device's battery, and choose to enable or disable automatic throttling of older devices to prevent random shutdowns. The update also includes four new Animoji, support for Messages in iCloud, ARKit 1.5, and tweaks to Apple Music and Apple News.